Thirty years ago Tenerife, and indeed all the Canary Islands, were the popular winter sunshine holiday destinations from the United Kingdom. Just four hours flying time from London they offered a friendly climate and inexpensive Spanish pesetas. The cheap dollar and the emergence of cost effective long range aircraft and aggressive marketing by worldwide competition has intervened over the years. However Tenerife proved resilient, 1.8m Brits visiting the island in 2008. In recent years the cruise ship market has expanded with over 300 ships arriving last year. 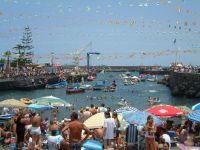 Tenerife has the infrastructure to accommodate the surge of often 10,000 people arriving in a single day when four large ships dock within an hour of each other at Santa Cruz. Fortunately the once rather drab port city is now much revitalised as a serious holiday destination. Tenerife says that the current grim economic situation has not influenced this market, the rising air costs working in its favour, and with a capacity to adjust to the high price of the Euro for those from the UK. VAT is 5% helps and the shops are keen to move on electronic goods even if the margins are low. However 90% of the agricultural requirements are imported so do not expect bargains when it comes to meal times, except of course for fish. Tenerife’s greatest virtue is the sunshine. The temperature never falls much below 15°C and in the peak of the summer 30°C is seldom reached. The wettest month is December, with perhaps 4/5 days of rain but in June, July and August you will not require inclement weather protection. For 2010 there are direct non-stop flights from most British airports with the notable exception of Heathrow, including easyJet, Flyglobespan, Jet2, Monarch, Ryanair and Thomsonfly. The island is served by two airports, aptly named Tenerife North (TFN) and Tenerife South (TFS). The old airport, TFN, these days serves the capital Santa Cruz, the old government centre of La Laguna, and the resort of Puerto de la Cruz. Iberia and Binter Canarias offer flights from the modernised airport and re-built terminal. TFS, 40 miles to the south, was opened in 1978 and is about to be brought up to date as regards to public facilities, but not before time. Its introduction started off a building boom in the south of the island, Las Americas expanding significantly from a small sleepy resort area to today’s holiday extravaganza, nearby Los Cristianos, and Los Gigantes. Hire a car when on the island. It is not expensive. At the end of the day you can’t go far, typically Playa De Los Cristianos to TFN is only 50 miles, and petrol is cheaper than in the UK. However if you are staying in one of the towns the public transport system is good and pensioners are entitled to free travel. There is an excellent tram system linking Santa Cruz and La Laguna, which is a World Heritage site. Conferences, business events and incentive marketing opportunities are particular targets of the island’s tourism industry typified by its choice as the ABTA destination for the 2007 convention. Collectively called the meetings and incentive market (MICE) Tenerife now has a great deal to offer, in particular modern conference facilities and some of the highest quality hotels and apartments in Europe. It claims to have more five-star hotels than either Barcelona or Madrid and a more temperate all-year-round climate than either of the Spanish cities. The island also has eight golf courses. 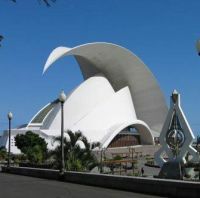 In terms of facilities the new, 2004, Tenerife Auditorium, for which the Sydney Opera House must take credit for the external design, was created by the famous Spanish architect and Engineer Santiago Calatrava. Located on the seafront in the centre of Santa Cruz its curved contours are impressive. The main hall, with its steeply raked seating, has accommodation for 1,658, whilst downstairs the Chamber Music Hall seats 428. There are ten breakout rooms of various sizes. The whole complex overlooks the spectacular lido Parque Maritimo with its seawater swimming pools built around an ancient fort. A nice touch is the decorative painting of the local gasworks which loom in the background. Much better than drab grey. The Auditorium offers a full year round programme of musical and stage events including Mamma Mia which is on over the New Year holiday period. Other MICE facilities include the avant garde Tenerife South Convention Centre with accommodation for up to 2,500, the International Trade Fairs and Congress Centre with nearly 15,000 sq metres of exhibition space; the Congress Centre of Puerto de La Cruz set in a sub-tropical garden with space in the main conference hall for 1,700 and finally the Arona Pyramid Convention Centre set in the luxurious Mare Nostrum resort, suitable for up to 2,000 delegates. As our picture shows the main theatre has a 350m stage which opens up to views of the stunning Roman pool complex under a star studded sky. Tenerife's central mountain, Mt Teide, stands at 12,200ft, and it is the highest in Spain. 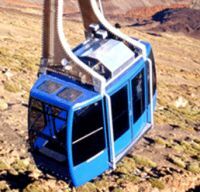 A cable-car ride to the summit offers unrivalled views of the lunar-like landscape of the volcanic slopes. The view from its peak on one of the frequent crystal clear days is simply breathtaking. If you decide to make the trip take some warm clothing with. It can be very cold 10,000ft above sea level in a rarefied atmosphere. Tenerife really does have something for everyone. Many British retirees have settled on the island and find the pace of life perfect (and English spoken everywhere). 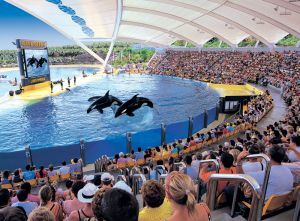 For the little ones there are safe beaches and some outstanding attractions highlighted by the AquaLand Water Park and Loro Parque.